In order to achieve affordability and high quality broadband services, you … need to look at wholesale-only based models. The reasons why such models fail if they are provided within the traditional vertically-integrated telco telecoms marketplace are that, in order to protect shareholders’ value of their current telco models and technologies, the incumbents will typically thwart and delay any wholesale-only model that provides new levels of competition and innovation that they are unable to compete with. They undermine the development of new business models by mounting campaigns of misinformation, seeking barriers to entry, using litigation as a competitive weapon, and engaging in predatory pricing or targeted rate discrimination. Budde doesn’t explicitly say that he believes the MTM model proposed by NBN Co for the Coalition’s Broadband Network will avoid a wholesale-only model for the CBN, or that he believes that Telstra won’t be structurally separated under such a model. However, the analyst clearly appears to be worried about such an eventuality. And who could blame him? If you look at the MTM model, what is immediately apparent is that it places a heavy reliance on Telstra’s infrastructure — both HFC cable and copper. No agreement has been struck between Telstra and NBN Co yet for access to re-use that infrastructure, and, despite the protestations of Communications Minister Malcolm Turnbull, nobody quite knows what it would cost in any case. I strongly agree with Budde’s comments. The CBN project must go forward as a wholesale-only project. Australia cannot afford to repeat the mistakes of the past two decades and leave Telstra as a vertically integrated monopolist of any kind. Let’s hope the Coalition realises that fact. But surely that is the point of the MTM? To reassert the privileges and perks of monopolies such as Foxtel and Telstra. It certainly can’t be to provide 21st Century broadband to Australia. The whole charade we’re going through at the moment is a slow exercise in maintaining protected markets and keeping the circle of political/corporate directorships well primed. It is unbelievable the connections with Telstra that exist on the board and any queries about potential conflict are just waved off. Malcolm shares ownership of a boat with one of them!!! It is my belief Malcolm has been a Telstra puppet ever since their policy announcement at Foxtel studios and basically reading their script ever since. If Turnbull succeeds, make sure you have LOTS of Telstra Shares…. I wonder whom is going to be the one repeating that phrase about Turnbull? We will regret this for decades to come! i would amend that to ‘If the CBN must go ahead, it must be a wholesale only project’ myself but hey i am neither writer nor editor…. though committed to pre election, separation arrangements i suspect are not viewed as ‘core promises’ for that reason. likewise the idea of doing a baby bell arrangement – viewed in that ideological prism – i rate as highly unlikely though it is one drastic solution i can think of in a telco market… in terms of a ‘free market’ fight split three ways between the iinet group and everyone else vs two separate ex telstra halves, with money and network backing to do their own rollouts vs everyone else … no i see you are laughing too, it wouldnt happen would it? the easiest move for the Coalition is also the most short sighted, fold it back into Telstra. timewarp to early 90s, anyone? i didnt think so. Budde’s line is one of my many complaints too – the headline $ number isnt whats really important, or necessarily the tech used, but a holistic view of the enterprise – all the backing work with GIS etc, parts needed, labour hours involved, training and labour availabilities, and yes the way its sold and presented to the end user (which layer), or if the port on the wall is just by itself or part of a vertically integrated stack? funny thing is a year ago the Telco industry had fairly good stable long term plans for the industry, fairly certain of where things were going and when would be good points for investment and so on. its now in a messy hiatus, and soon it looks rather like the only ‘certainty’ we’ll have is the kind from 20 y ago – i dont reckon that was a good trade. it looks an awful lot like the US model and to me that model is one of the resounding failures of the market, insofar as competition in those markets is often about killing alternatives (very litigious) and hiving off areas against competition by owning the infrastructure. infrastructure competiton actually has not increased network spend but stagnated it, upgrades happen at a slower rate and it takes a serious amount of cash to get into an area as a new operator (look at google fiber – you could probably do the same as a smaller market cap company, but not that much smaller, i suspect. it simply takes a lot of backing to jump the requisite hurdles – most new competitors dont have that so the market stays with the incumbent a lot longer than it would otherwise have). i really really dont want to see that failure replicated here, but to these bizzarro world people, its the best thing since sliced bread. ugh. There is an easy way to accomplish this for about the same ballpark figure. Telstra market cap is ~64bill less any shares the gov already own, buy back Telstra. Separate and sell off retail and mobile like they should have done in first place paying back some of that 64bill you borrowed to buy the complete company. Heck you could keep the mobile network infrastructure and wholesale it(never happen as I’m sure Optus and Vodafone will object). You now own the infrastructure and can begin continuous upgrading with the revenue received from wholesaling like what should have been happening for the last 15 years before Howard screwed it up. The point is infrastructure should be in gov hands and available for all comers to profit from not just a few lucky individuals who happened to get in first. Transport in the country would be in the same position as communication if for example QANTAS or Virgin owned all our airport, of if say Toll IPEC owned our national highways, but that is situation we have in telecommunications. thats another possibility but the ideological prism problem comes in again – it really doesnt seem in the Coalition DNA to try something like that. it really is down to a solution that fits their ideology, or there is a break with tradition and try one of these other paths – there are quite a few on offer if you arent welded to free market first etc etc etc. the former leads to distinctly shite outcomes, and the latter at least offers hope that some of the worst structures of the telco market in Australia could be addressed. my read is they are predisposed to the former path and i havent really yet seen a proposal there that remotely satisfies me, on costs, design and market access/blackspots issues. it doesnt look good, but one lives in hope…. Having been watching with interest, even just at the Whirlpool round-up, he’s absolutely correct. Mission accomplished, one might suggest…! The problem is the inclusion on HFC from Telstra and Optus. This has all-but ensured that MBM will not be wholesale only. Budde can see the writing on the wall, as much as anyone else can at this point. Neither currently wholesale this product, and there is unlikely to be any structure in place, from a process and billing perspective, for it to occur without change. It would require that both Telstra and Optus make changes – they’re both commercial enterprises, so there is sure to be a cost associated – worse, is that there’s no current agreement in place; so we have environments that aren’t really set up for wholesale, and no financial incentive (as yet) to make that happen. Meanwhile, HFC is supposed to account for what, 30% of the MBM? Ludicrous. Turnbull has two choices; adjust legislation to allow Optus/ Telstra to continue to own and operate the HFC networks independently, which means automatic infrastructure competition; or strike an agreement to lease. The former also opens the flood gates for TPG, iiNet and anyone else capable of building a network to plough in competing infrastructure to the NBN. How it can remain viable under this kind of obvious competitive pressure, is anyone’s guess. It was bad, but not horrific, when Turnbull stated FTTN would be the alternative, going into the election. At least it would mean a unified network. Going from a (albeit slow to construct, with politically driven and retarded deployment choices) fibre network that would have stood us in great stead, to a ridiculous conglomeration of incompatible systems across lord knows how many providers. All to be “cheaper, faster”. Really, simply changing the build order to ramp up deployment in built up areas as a priority, would have had a huge impact. Don’t forget the bush, by any means (lord knows they’ve been screed over for long enough). But at least get a few major metro areas done in tandem to boost connection rates and get the bloody build back on track. It wasn’t great; but could have been fixed. Now? It’s a cluster f*ck. I should clarify that TPG, et all ploughing in connectivity to MDUs, and anyone else for Greenfields’ isn’t a bad thing; anything that’s faster than variable ADSL2 is going to be great. It’s that we now have basically a slightly-faster version of the current situation. Multiple disparate networks that are a nuisance to switch between and don’t have the ubiquity to allow IPTV and all manner of other cool technologies and services that would otherwise flourish on that kind of platform. Folks have become obsessed with “make it happen faster” and have ignored the lights of the oncoming train in the process. “But at least get a few major metro areas done in tandem to boost connection rates and get the bloody build back on track.” This would also have the added benefit of reducing the peek funding cost as you get substantial revenue earlier in the project. 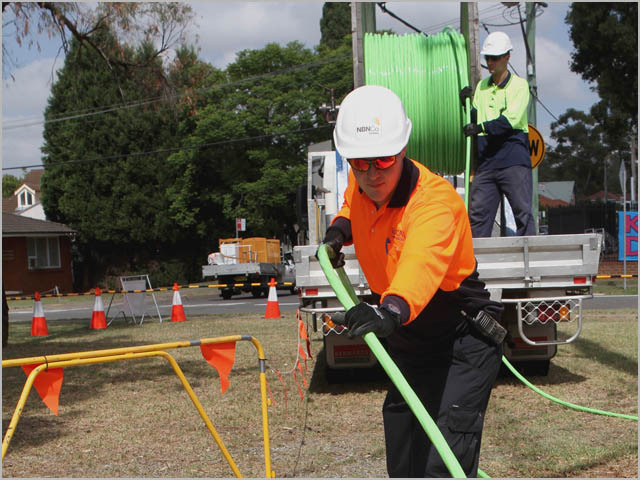 There are already a significant number of site suitable for roll out of FTTB as an example significant parts of the Darwin CBD have NBN fiber rolled out with a reasonable quantity of MDUs unable to connect, rapidly test your bulk roll-out then start pushing into high density markets. Apart from some council and NIMBY delays by all account rollouts of Fixed wireless are going well and this is what the truly rural areas are getting either way in the short term.